Cold and flu season is officially here. Dentist in Newberg Dr. Jennifer McLeod and her team at Newberg Family Dental understand how important it is for patients of all ages to stay healthy during this time of year. As leaves turn colors and fall from the trees, consider these head to toe tips to keep the cold away! Keeping germs away from your head – and especially your face – is a simple and effective way to stay healthy during this cold and flu season. 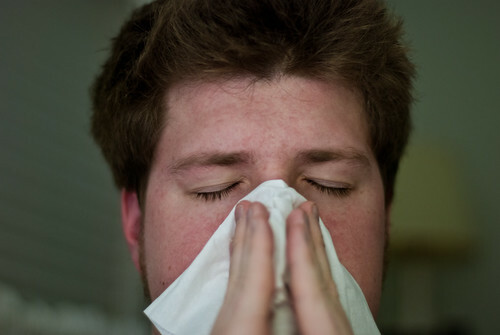 Cold and flu viruses spread through the air and from surfaces. Avoid touching your face, especially your mouth, nose and eyes in order to keep those germs from spreading to you! If you are already experiencing symptoms, be considerate of others and cover your nose and mouth when sneezing or coughing. The best way to prevent the spread of germs is to cough or sneeze into the crook of your elbow to avoid getting germs on your hands and then spreading them onto surfaces. Use tissues that you can then discard in the trash to help keep germs from getting on your hands. Another essential way to keep germs off your hands is to wash them frequently throughout the day. Using soap and warm water, wash your hands for at least 20 seconds at a time. While alcohol-based sanitizers are good for those times when there is no access to soap and water, it’s important to use them in conjunction with frequent hand washing. There’s a reason why the saying, “An apple a day keeps the doctor away,” is so popular. A diet full of whole foods can keep your whole body working at its best to fight germs. Stick with a diet that’s full of fruits, vegetables, healthy fats, legumes, and lean protein sources to keep your body running smoothly and at its healthiest. Foods like these are full of nutrients to help your body naturally fight disease. Falling to sickness can sometimes happen when we don’t get enough sleep. If you don’t have an early bedtime, it’s time to start. The nights are getting longer and it’s getting darker outside earlier, which makes this a prime environment for some extra shut-eye. Work on getting a full 8 hours of sleep per night to keep your body in shape to fight the cold and flu germs! Last but not least, treat those legs and feet to some exercise and then some pampering. Your well-rested, well-fed body will be ready for a good workout. Put on some athletic shoes and start moving a little bit each day. Try a 30-minute walk during your lunch break at work or right after dinner. The exercise will help keep everything in balance as you avoid germs this cold and flu season. To help your body stay healthy and strong, schedule an appointment with Newberg dentist Dr. Jennifer McLeod. Call Newberg Family Dental at t (503) 278-4281 for your personal appointment!